One of the perks about living in Miami is that plane tickets to the bird-rich Caribbean, Central, and South America are often cheaper than going to places like Arizona, Colorado, or California. Many of the Caribbean islands (except Cuba and Hispaniola) make for ideal, quick birding trips where one can see all the endemics and Caribbean specialties at a leisurely pace — usually, with extra spare time to explore historic cities such as old San Juan in Puerto Rico or lounge on beautiful beaches such as Frenchman’s Cove in Jamaica. Having paid a visit to Puerto Rico in 2011 with a friend of mine, the next logical island to visit was Jamaica with about 28 endemics plus several near-endemics. After postponing the trip several times and ironing out the details of the trip, it was finally time to go. Flying into Kingston at night, I made my way up the winding road in my rental vehicle to Hardwar Gap in the Blue Mountains at dawn. Blue Mountain Vireo was very common, always in pairs, around the highest part of the Hardwar Gap Road. After flushing many White-chinned Thrushes off the road on my way up, I made it to the entrance of Holywell Recreational Park at around 8AM. As I got out of the car, I could hear the carols of Rufous-throated Solitaires ringing throughout the park — although locally abundant here, this would be the only location where I would see them on this trip. Not exactly sure of where to go, I made my way down a dirt road that sloped down from the parking area, coming across a feeding flock of North American warblers that included both Jamaican and Blue Mountain Vireo (although described as somewhat tricky to find, I found many Blue Mountain Vireos at this high elevation site but did not see it again elsewhere). It then began to rain, so I retreated to The Gap Cafe just down the road for some famous Blue Mountain Coffee and toast with pepper jelly. After the rain subsided, I continued down the road and came across a fruiting tree with quite a bit of commotion around it — Black-whiskered Vireo, Sad Flycatcher, Jamaican Woodpecker, Jamaican Spindalis, Loggerhead Kingbird, and Ring-tailed Pigeon were among the species present. I stuck around for a while to see what else would show up, and it paid off — a Greater Antillean Elaenia, not often seen in Jamaica, showed up and stayed around long enough for photographs. Although I did not find them to be as wary as other quail-doves, Crested Quail-Doves are still quite shy and difficult to approach close enough for a good photo. Excited about my find, I continued on my way to a dirt side road called Woodside Road. As I was walking down and scanning the trees quite carefully (frustratingly, hearing but not seeing Chestnut-bellied Cuckoo and Jamaican Becard), I came across a roosting Northern Potoo! A pair of spectacularly colored Crested Quail-Doves allowed for stellar looks just around the corner with their odd, teetering gait. It began to rain again at this point, and being over 30 minutes walking distance from my car, I was completely drenched by the time I got to my vehicle and the rain subsided. I pressed on back into Holywell itself. Through the heavy fog bank along the Waterfall Trail, I spotted my first Chestnut-bellied Cuckoo (huge!) and called in a pair of Jamaican Becards. I made my way to the coast to Hotel Jamaican Colors just north of Manchioneal for the night having seen 23 of my target species already. 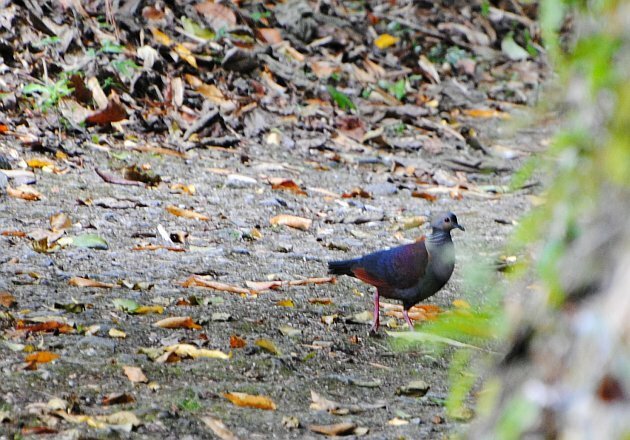 On the second day, I got off to an early start at Ecclesdown Road in the northeast corner of the island, flushing a Crested Quail-Dove right near the beginning. Intermittent heavy showers made birding with any consistency difficult at first. One of my first stops included a second Chestnut-bellied Cuckoo and my first Jamaican Lizard-Cuckoo together in the same tree. As the morning showers cleared and the sun began to shine, parrots became active but the only species I would see on this day would be Black-billed Parrot. The jabbering calls of Jamaican Crow were omnipresent, but I would only have good views of one as it flew by with a pair of Gray Kingbirds in hot pursuit. 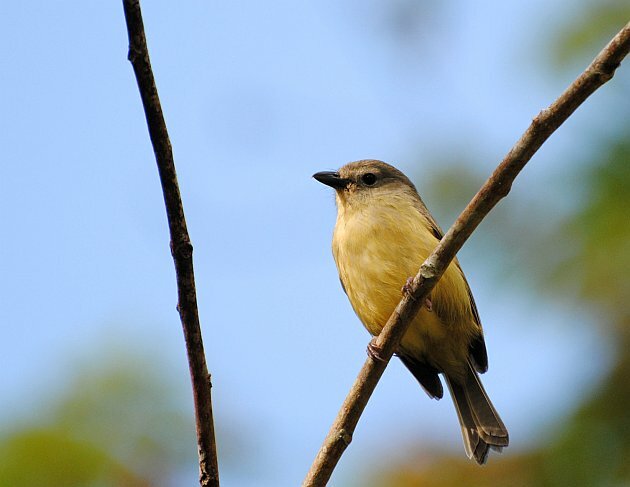 Many of the same endemics seen on the previous day were common here as well with several additions such as Jamaican Pewee, Jamaican Elaenia, and Jamaican Euphonia. I was beginning to worry about Jamaican Blackbird, as I had missed it the previous day at Hardwar Gap and would have only one more shot at this species if I missed it here. 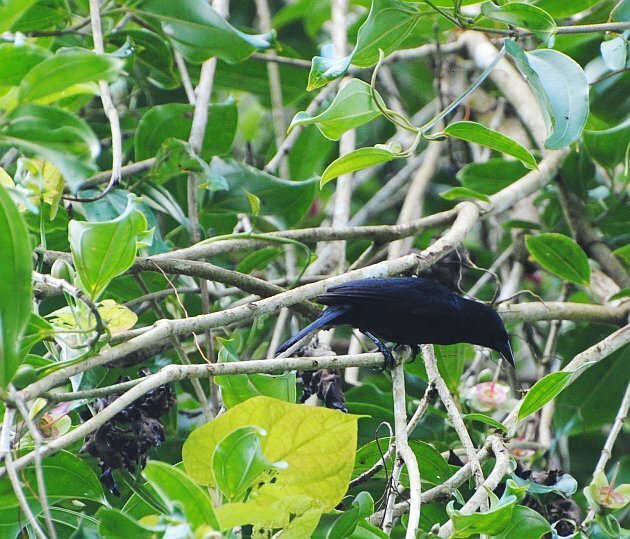 Like magic, a dark bird flew into a tall tree right beside the road. I stuck my head out the window and looked up — and there it was! I fumbled for my camera and began taking shots of it before it flew off. After realizing that it wasn’t going anywhere anytime soon, I got out of the car and took a more calm approach to observing it’s unusual (for a blackbird) behavior. What a treat! On my way back at around noon, I stopped at Goblin Hill and asked the staff if I could watch their feeders to which they obliged — Jamaican Mango showed up within minutes. Exciting stuff Carlos! Glad you made it to Jamaica, I’m looking forward to reading about the rest of your trip. April 28, 2013–I am in Falmouth, Jamaica today and saw a swallowtailed hummingbird….we are in the Northwest area and it had a black bill, not a red bill. Also, are these mockingbirds with the white stripes on the tails Northern Mockingbirds…..? 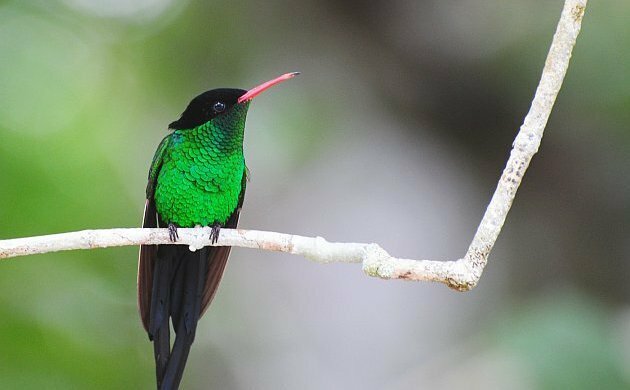 Saw some other lovely birds in our casual look-around…..
Hi Karen: the only hummingbird with a long tail in Jamaica is the Streamertail, with Red-billed being found over most of the island and Black-billed being restricted to the northeast (such as Port Antonio). Northern Mockingbird is very common and widespread across the lowlands of the island, so that is likely what you are seeing. Enjoy your time there! Where Are You Birding This Fourth Weekend of April 2013?